Sometimes a web redesign is a big step forward; sometimes it is a step in reverse. 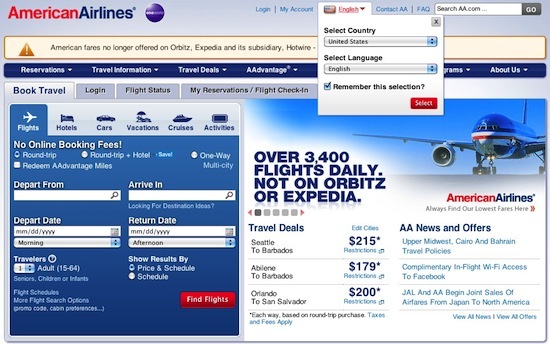 In the case of American Airlines (when viewed from a web globalization perspective) a recent web redesign resulted in a significant step backwards. American Airlines came out on top in last year’s Web Globalization Report Card. But in this year’s Report Card the company slipped several places. Emirates took over the top spot. The new design does feel more user friendly to me. But when you evaluate the web site from a global perspective, there are flaws, such as with global navigation. American Airlines uses a new global gateway that is more cumbersome to use than the previous gateway. It is a two-step menu, shown in detail below. 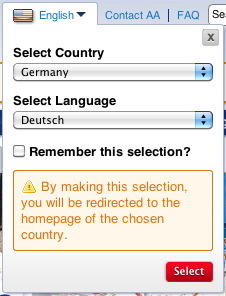 Imagine you don’t speak English and you were trying to get to the German web site. Would the warning text highlighted in yellow concern or confuse you? It certainly appears ominous to me. American Airlines also gave up using language negotiation, which is more important than ever before. To its credit, the new American Airlines web design uses considerably fewer images with embedded text. And though the localized sites still largely support the legacy design, I’m optimistic that by this time next year, global consistency and localizability will have improved. Now let’s look at Emirates. Emirates employs one of the best global gateways around. It is easy to use and, by grouping countries by region, presents more manageable lists. 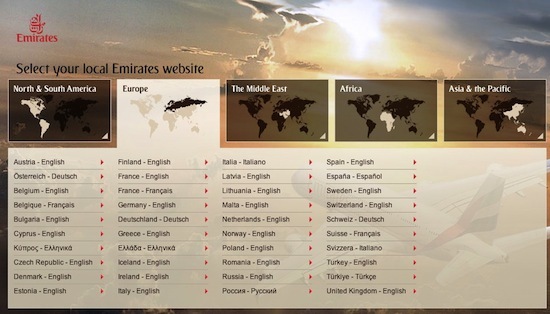 Emirates also supports excellent global consistency across all of its localized sites. And Emirates does not even lead this category in languages. KLM leads with support for 26 languages, followed by Air France at 19. Airlines in general have much work left to do in expanding breadth of languages. But should Emirates invest in additional languages, it is well positioned to lead this category in the years ahead.